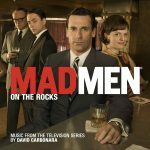 David Carbonara is the composer of the critically acclaimed series Mad Men, winner of multiple awards including three Golden Globes and four consecutive Emmys for Outstanding Drama Series, and multiply album releases. Recent album releases include, The Secret Life Of Marilyn Monroe, The Independents, Glickman, & Carl Laemmle. ..."it’s a thoroughly comprehensive demonstration of series composer David Carbonara’s musical dexterity when it comes to setting a score to Don Draper’s drinking. Carbonara takes a number of musical styles and shakes up an audio cocktail to pour in your ears, creating tracks so individually distinct you could almost be fooled into thinking they weren’t born from the same show."